I guess it’s spring, people! The weather has started warming up, but I hardly took any blog photos in March thanks to constant rain on my cutest days. 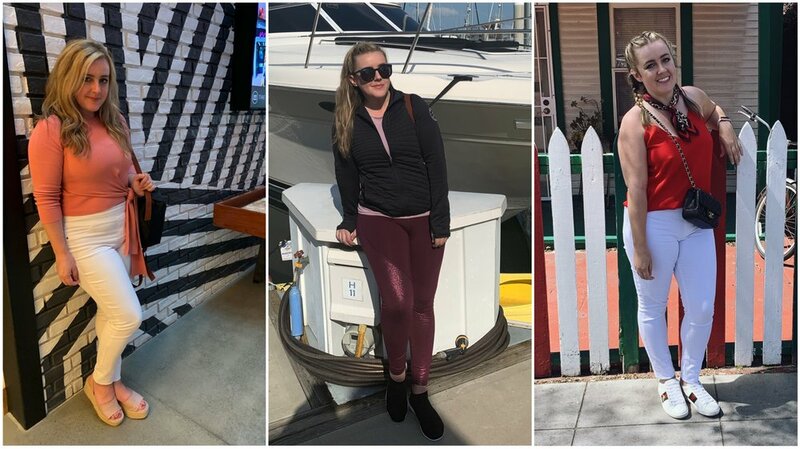 Bad planning on my part…but the good news is that I take daily photos with my Echo Look so I have SOME evidence that I wore clothes this month. 3/1: These are my favorite pants. I’m so glad I ordered them on sale (and the matching jacket, which you’ll see later this month!). 3/2: I re-discovered this longer camisole from LOFT in my closet this year, and layering it under a sweater, over leggings has been my favorite weekend getup. There was a Mardi Gras parade in SoMa today so we checked that out and then went and ate a ton of crawfish cheese dip (it’s amazing) at Rebel Kettle Brewing Co.
3/3: Little Rock Marathon Day + Cold + Rainy = I stayed inside and in my comfies most of the day. 3/5: Work from Home (AKA Old Navy Leggings). At some point I put on something Fat Tuesday festive but apparently didn’t bother to take a photo. 3/6: I’ve had this shirt for over a year and just now figured out that it’s a cute layer shirt! This cropped sweater remains a closet MVP and I wish I had more colors. If it ever unravels, I will be devastated. 3/7: Work + Volunteering at a Create Little Rock event. These pants are from ShoeDazzle randomly, but I have LOVED them because they’re stretchy and comfy. 3/8: Super casual day + some working from coffee shop. 3/9: Pulled out our bikes since the weather was gorgeous and rode to the State Capitol to hunt Pokemon. 3/10: Daylights Savings and Errands. The Everlane Day Glove has proven to be a favorite flat this month! 3/11: I guess I was feeling ambitious on a Monday? Finally got around to wearing this Leith dress I bought weeks ago (here’s the sleeveless version - I love this shape). 3/12: WORK FROM HOME TUESDAY!!! 3/13: This is the suit I was talking about! I ordered the jacket when Blair’s collection first came out, but it was way too big and a little pricey for what it was so I sent it back. Fast forward to it going on sale, me ordering it in a smaller size (and petite!) and getting the pants too (now on sale at Rack). I love this outfit. 3/14: Got my hair done today and wore another suit. I am officially a suit girl. This is my favorite trend in years. This is another petite number, this time from Asos. I also finally wore these heels out of the house after a month of sitting in my closet, afraid of committing. 3/15: Work + Radio Remote (I later changed into my radio sweatshirt for that, though). 3/16: St Patrick’s Day parade and block party on our street! I did order a skirt and a headdress just for the occasion, and then discovered that the Irish Step Dancers were wearing the exact same skirt. Cooooool. 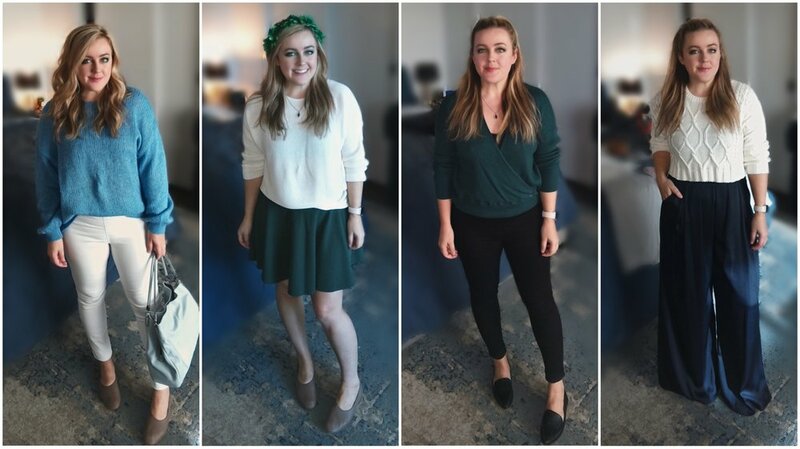 3/17: Actual St. Patrick’s Day called for more green. We went and saw Evita at the Robinson, which I didn’t really care for but I’m glad I saw. 3/18: I left work early today to go home and pack for my trip to San Diego! We also skipped cooking and went to Sushi Cafe instead…yum. 3/19: Flying to San Diego! Time for you guys to cross reference what I said I packed with what I wore. 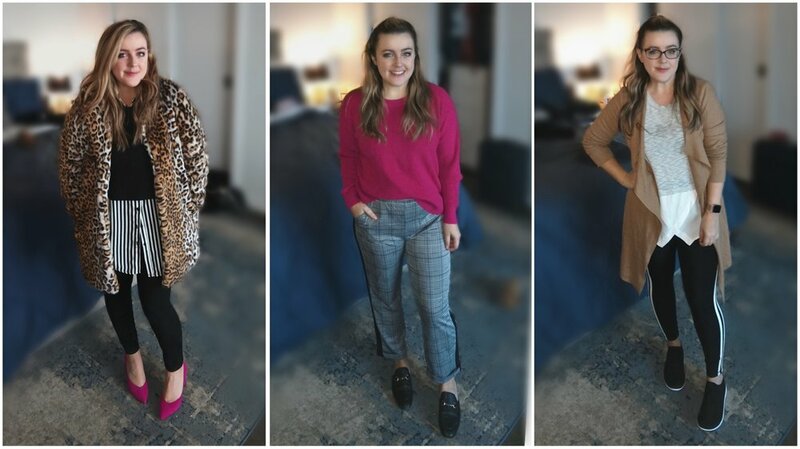 If you want to see more of my outfits check em out here. 3/20: General exploring in San Diego and shopping. 3/21: First Day of the Conference! 3/22: Second Day of the Conference! 3/23: We moved to the yacht today and took the trolley down to Tijuana. 3/25: Spent some time in Little Italy before hopping a plane back to Little Rock. 3/26: I always work from home on Tuesdays, even on the days that I’ve been gone for a week. I didn’t want to wash my hair so I didn’t go to work, but I still managed to have a jam-packed day with radio and voice over gigs. 3/27: I did eventually wash it and bam! I’m back on the outfits. I took a photo in this skirt c/o SheIn but finally got to wear it in an outfit and I gotta say, it’s a fun little number. 3/28: One of my favorite things about coming home from vacation is all of the BOXES you get! My Spring box from Elizabeth & Clarke showed up and I love this shirt they sent. It was a gorgeous day so I met some friends on a patio to enjoy the weather. 3/29: Casual Friday. Ready to spend the weekend cooking and doing Peloton classes (get $100 to the boutique with my code HM8UTY when you buy a bike! DO IT LETS BE FRIENDS!). 3/30: We did very little on this Saturday, except go to Lowe’s and go look at Macbooks at the Apple Store. 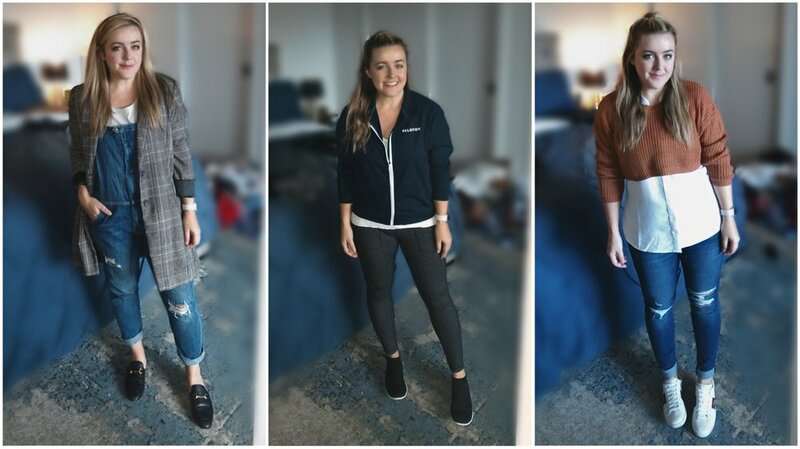 I bought two pairs of “street” leggings from Old Navy’s athletic wear on sale the other day, and they’re awesome for casual errand running for sure. 3/31: Barkus on Main day! It’s a giant dog parade and block party in downtown Little Rock. We followed it with crawfish at Rebel Kettle, cheese dip at Lost Forty, and tacos at Cantina Cinco de Mayo. Which I followed with a long spin class when I got home, because woof. 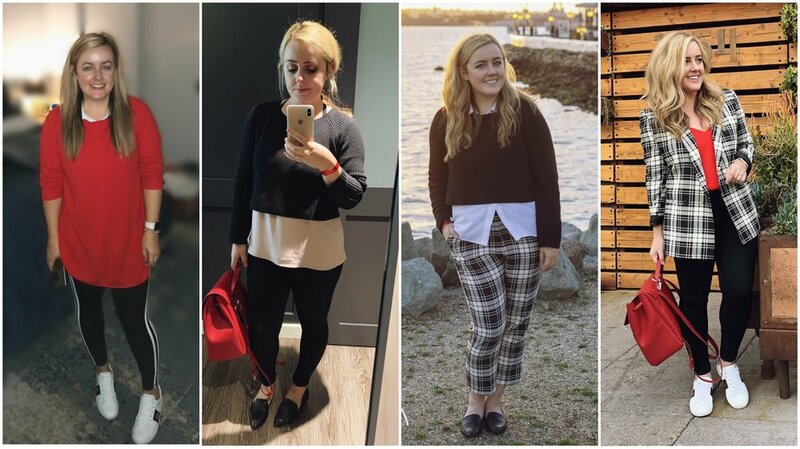 That’s (almost) everything I wore in March! I do have a tendency to change into workout/athleisure when I get home these days, so look for a post about that stuff coming your way some day soon. If you have any questions about where I got certain pieces, let me know in the comments or shoot me an email!